Moana was originally farming land from 1841. In the 1850s a local landowner lent his name to the beach and it became known as Dodd's Beach. In 1855, when shipping was the primary means of cargo transport in the area, the Nashwauk was wrecked on the beach near the Pedler Creek outlet. Due to an increased interest in tourism in the area, in 1927 the land was subdivided by Lake Beach Estate Ltd who held a competition to name the new town. Mr C.H. Cave won the competition with "Moana", which is a Māori-language word meaning "ocean". The land was divided into blocks of land suitable for holiday homes and wide streets were planned and laid out, but due to the Great Depression in 1929 development of the area was slow. In the 1950s Moana experienced renewed interest from tourism as the residents of Adelaide enjoyed the freedom and mobility of car ownership - Moana was a pleasant 40 minute drive from Adelaide. One of the landmarks of the area was the Moana Roundhouse which was demolished in 2006. In recent times, the urban sprawl of Adelaide has reached Moana (and beyond) and so Moana is now one of Adelaide's outer southern suburbs. Moana is a seaside suburb. It is divided into two by Pedlar Creek and the associated sand dune reserve. The northern part of the Moana is referred to as the "old survey Moana" and the southern housing development as the "new survey". The Coast to Vines rail trail passes through Moana. There was a station at Moana on the former Marino-Willunga rail line that it follows. Moana is serviced by the 741, 745, 747, 749 and 750 bus routes which terminate at the Centro Colonnades and Noarlunga Centre Interchange. Moana has a clean white sandy beach, a caravan park, an RSL hall and kiosk. Moana has a Surf Life saving Club which patrols the beach over summer. It is one of the last beaches in Adelaide where a vehicle can be driven onto the beach and parked legally. In 2008 the foreshore area of "old survey" Moana has undergone redevelopment by the local council, with improvements to the road, walkway, and sea wall. A new toilet block and shaded "gazebo", the latter shaped in the form of a seagull, have been added to the foreshore area. A sloping ramp at the north end of the foreshore that originally provided access to the beach was damaged by erosion of the cliffs during storm activity in 2007. The local council are improving the cliff stability under the ramp. The council have removed the sloping ramp, but the concrete stairway at the north end of Moana beach is unaffected by these changes. ^ Australian Bureau of Statistics (27 June 2017). "Moana (State Suburb)". 2016 Census QuickStats. Retrieved 14 January 2018. ^ "Southern Adelaide SA Government region" (PDF). The Government of South Australia. Retrieved 17 April 2017. ^ "Search result for "County of Adelaide, CNTY" with the following data sets selected - "Counties" and "Local Government Areas"". Property Location SA Map Viewer. Government of South Australia. Retrieved 24 April 2017. 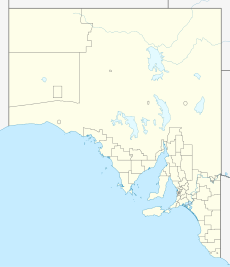 Wikimedia Commons has media related to Moana, South Australia. This page was last edited on 7 March 2019, at 14:19 (UTC).